Walk With Wina: Happy 3rd birthday Wina! It's not the perfect birthday so far. Ayah wasn't around, Wina keep tangling on me becoz of the new room mates at home (mama*her grandma* and nenek Ayu), and it's a little bit raining here and there. So, first i planned for a barbeque birthday party in our club house. Uda rejected the idea, becoz he didn't want to spend HK$2500 for a party that he can't attend. 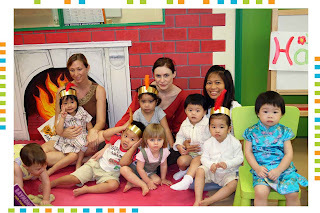 Plan B, we can rent a school playground for HK$1000 (cake not include). I like this idea, but again, a lot of money for a party that Ayah cannot attend, will he let us? Naaaaahh.... no way! 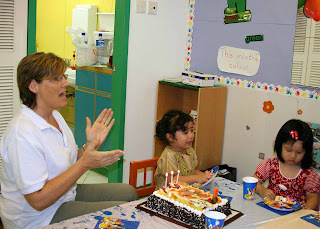 So finally we settled with having the birthday party at her school. 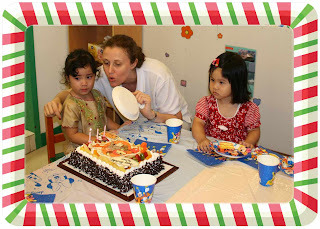 Wina go to 2 schools, so we celebrated her birthday twice, with 2 different groups & different cakes. With the cakes and the take away gifts, still much more to save than the first 2 plans. I thought, kids would LOVE birthday parties. I haven't seen any kids that's not happy with a birthday. And now i do. Wina cried all along in her celebration, both! It was disasters. Every time she saw me, she cried, holding my skirt tight, won't let me go even for a sec (and i was the cameraman). Uuuurrrgghh, it was so annoying! I almost lost my temper. If i walked just a little bit, she blowed her tears right out. 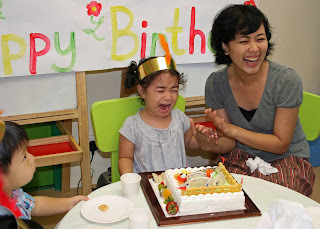 When everybody finished singing the birthday song, she cried even louder! haha, i can't hold my laughter here... She won't blow the candles, didn't eat the cake, no smiling, full of tears, she wasn't happy at all. OMG, it was horrible. 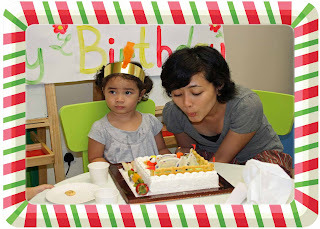 So, let this be a memory to remember : "Wina's Crappy 3rd birthday"
First time saw this, from far far away... laughing yet sad, smiling but feeling miserable seeing my little sunshine wasn't happy on her birthday. Happy belated Birthday WINA! i know why you cried, i would do the same also.. that's because AYAH was not there right?? Happy birthday to you.. this year i can't celebrate it with you, InsyaAllah next year will do. Bunda has done a fantastic arrangement for the b'day. welldone my dear. lots of hugs and kisses to both of you..
i am in Bali Now.. just arrived. eventually i have access to internet. funny enough, it is not in JKT... but have to be somewhere here..in Nusa Dua. Fabulous stories and pictures you put on this blog - love it so much!! hiks, susah amat mo chatting ama uda. makanya install YM dong! thanx 4 the comments. yg banyak yah!!!! Wah...Ulang Tahun Wina seru juga ya!...Wina sudah 3 tahun...Ngomongnya udah pintar sekali...Apa kata2 Wina yang terbaru setelah Ultahnya? Hi Wina dan Bunda Wina...Pawo senang sekali berakhir pekan dg Wina dan Bunda...jalan2 ke Victoria peak dan ke Sha Tin...Sayangnya Wina gak mau digendong Pawo...dan juga mau dekat...ditunggu di Jakarta. Haha....semua pesta ultah anak batita yg gw hadiri pasti sang yg berulang tahung selalu menangis kok ti.